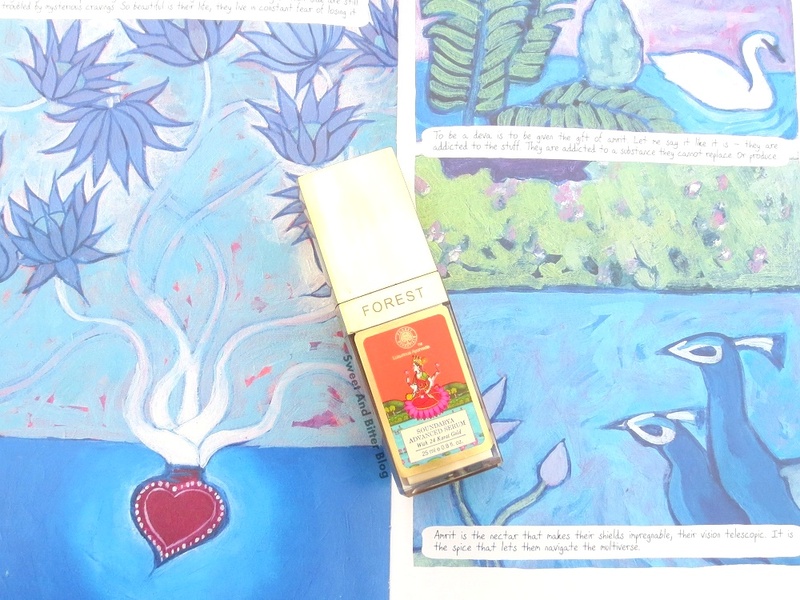 Why FE Soundarya Serum? Forest Essentials is very proud of the presence of gold bhasma along with various blends of oils, fresh cow’s mils, aged cow’s milk ghee and luxury herbs in their Soundarya age defying facial serum. It seemed like a unique and exciting thing to try. I had this in my list of oils to try, but the price seemed too much. When I was about to repurchase Kama Ayurveda Kumkumadi, I realized that Kama has hiked the price to Rs 1890 for 12 ml, and this is Rs 2950 for 25ml. So, this comes cheaper, and I jumped to get my bottle of golden luxury. 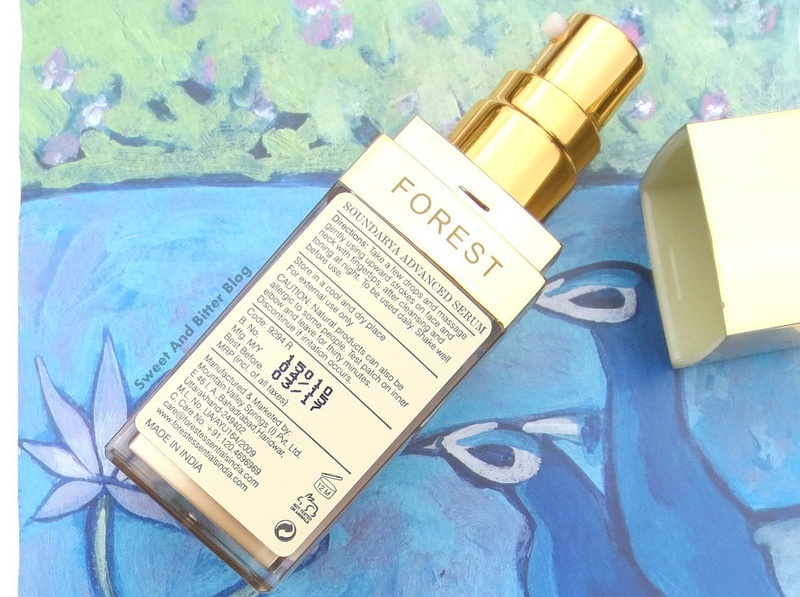 Packaging – This is one thing that you cannot miss in Forest Essentials product. Gold capped pump bottle with an intricate painting of Goddess Laxmi. At times, I do wonder if the price would have been lower if they have ditched the fancy packaging. But, I am sure that many are lured by that fancy packaging only. Ingredients - Instead of being very proud of the ingredients, Forest Essentials does not list the entire list of ingredients. Just the goody goody key ingredients on the outer carton - Sesame Oil, Ghee, Sweet Almond Oil, Milk, Licorice Root Extract, Turmeric Extract, Saffron Flower Infusion, Sandalwood Oil, Ashwagandha Root Extract, 24 Karat Gold Bhasma. Fragrance – Contains no synthetic fragrance. It smells like saffron and better than other ayurvedic oils. Texture – Thicker oil. Absorbed quickly into the wet skin. I apply after spritzing rose water on my face. Does feels oils when I apply two pumps instead of one, but it is slowly absorbed by the skin. Effects – I turn to face oils because they are better way to moisturize my skin, they work as anti-aging products and gives me a glowing skin. Also, natural oils and serums quickly remove spots, discolorations, and other skin issues. But, not this one. 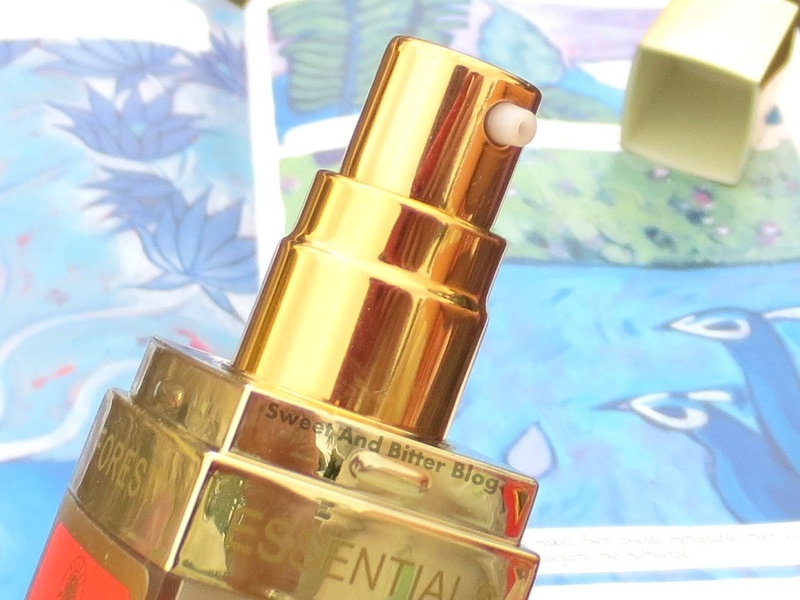 FE Soundarya facial serum is of good quality and it never irritated, burned, or gave me any breakout. When I used the trial sample, I liked it because it was doing good as a face oil and to see better benefits, I had to use it for longer. So, I purchased the full size (and I also have the price factor with Kama in mind). But, when I started using it, I never saw any major goodness added by this oil to my skin. Also, I could never use it continuously and had to skip it at times…for the greed of better skin. For example, I had some pimples on my forehead which left behind marks. I used this religiously for two weeks, and it seemed my skin was healing slower than usual. One night, I skipped this, used my other facial oils and I could see that my skin got much better in that one night! And this happened quite many times for various other reasons (spots, marks, discolorations, texture…you get the drill here). I now see this as a good maintenance oil. If your skin is trouble free and you just want to pamper and give your skin what it needs every day then use FE Soundarya Facial Serum. But, do not expect anything more than that. If you have any skin issue that needs to be targeted and worked on, then this is not the skin product for you. Maybe this will work like magic if used for more than a month. But, a month is not good when I get overnight results from others. Especially, when I pay good bucks for the skin care! I expect to see something good when I used a luxury facial oil for two weeks, but I got nothing for this. 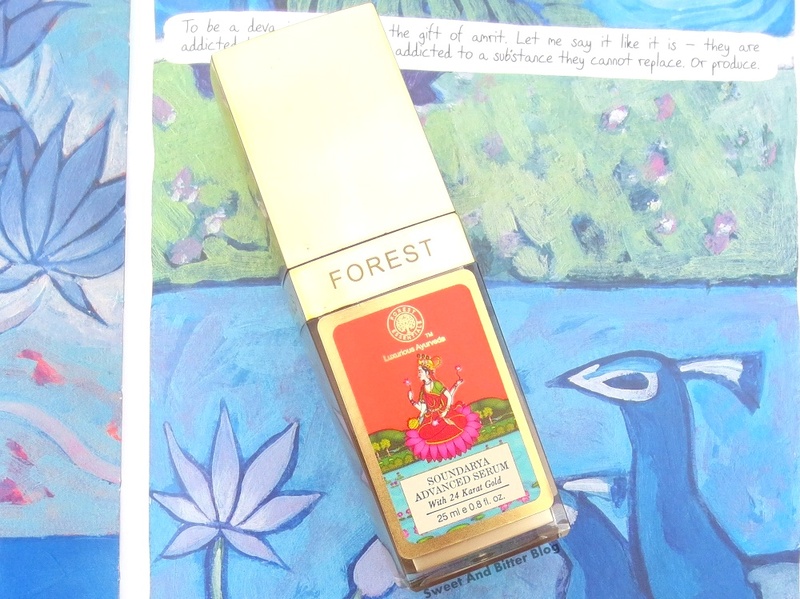 Overall – Forest Essentials Advanced Soundarya Facial Serum is a good facial oil with healthy ingredients. It does not burns or irritates skin. It is good moisturizing night oil for everyday use for trouble free skin. But, it fails to deliver anything more than that! It has no effects on spots, discolorations, and other skin issues. Plus, the ingredients list is missing. For the price I paid, I will list this as a disappointment.